Director – Angela Robinson, Screenplay – Robert Ben Garant, Alfred Gough, Thomas Lennon & Miles Millar, Story – Garant, Lennon & Mark Perez, Producer – Robert Simonds, Photography – Greg Gardiner, Music – Mark Mothersbaugh, Music Supervisor – Howard Paar, Visual Effects Supervisor – John Van Vliet, Visual Effects – CIS Hollywood (Supervisor – Thomas J. Smith), Entity FX (Supervisor – Mat Beck) & Industrial Light and Magic (Supervisor – Kim Libreri), Special Effects Supervisor – Matt Sweeney, Production Design – Daniel Bradford. Production Company – Disney. Teenager Maggie Peyton is part of a family line of racing drivers. The family are currently down on luck in the struggle to find backing so that Maggie’s not-very-successful brother Ray Jr can compete professionally as a driver. Maggie’s father goes to buy her a car from the junkyard for her graduation present. Maggie is pestered by old beat-up VW Bug that is scheduled for demolition and agrees to take it. She is startled to find that the car, which she learns is named Herbie, has a will of its own. With her at the wheel, it enters itself in a street race and ends up beating racing star Trip Murphy. With her face hidden behind the visor of a racing helmet, everyone believes that Herbie was driven by a mysterious driver known as Max, and Maggie is unable to bring herself to tell her father that she is Max. Trip burns at the humiliation and schemes revenge. He sets up a rematch race, asking her to bet for their pink slips. Thinking that she has abandoned him to drive Trip’s car, a disconsolate Herbie deliberately loses the race. It is up to Maggie to get Herbie back after Trip then places it in a demolition derby. She must then enter Herbie in the NASCAR race and regain the family name. The Disney rummage sale goes on. Throughout the 1990s, they managed to resurrect just about every animated film they had ever made as a cheap video-released sequel. They then went on to remake most of their live-action films first as tv movies and then again as cinematic features. In theatres we have so far endured remakes or revivals such as The Jungle Book (1994), 101 Dalmatians (1996), Flubber (1997), That Darn Cat (1997), The Parent Trap (1998), Freaky Friday (2003), The Shaggy Dog (2006), Race to Witch Mountain (2009), Tron Legacy (2010), Maleficent (2014), Cinderella (2015), The Jungle Book (2016), Pete’s Dragon (2016), Beauty and the Beast (2017), Mary Poppins Returns (2018), Aladdin (2019), Dumbo (2019) and The Lion King (2019). Herbie: Fully Loaded is a revival of the popular Herbie films that began with The Love Bug (1969) and passed through the likes of Herbie Rides Again (1974), Herbie Goes to Monte Carlo (1977) and Herbie Goes Bananas (1980), as well as the Herbie the Love Bug tv series (1982) and a tv movie remake The Love Bug (1997). One admits to not being terribly enthused about Herbie: Fully Loaded beforehand. 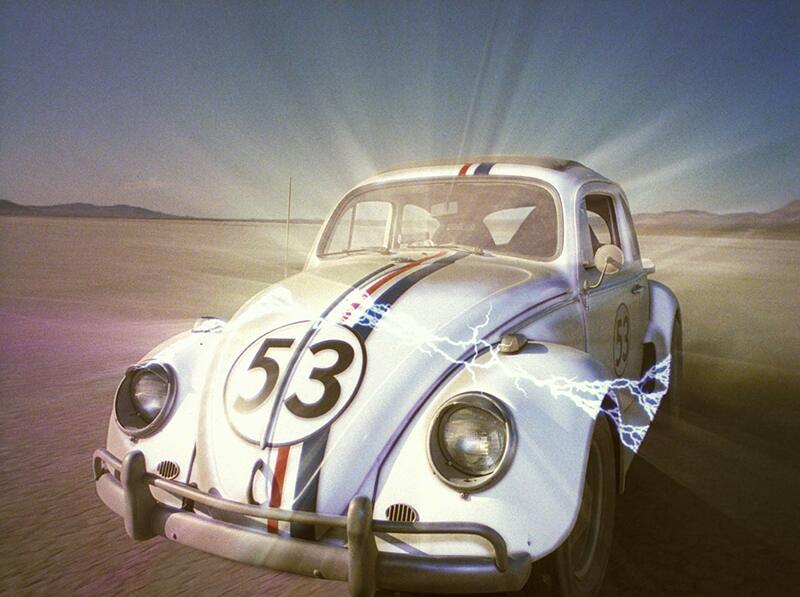 Most of the original Herbie films were likeable – especially the wonderfully nonsensical and surreal Herbie Rides Again. On the other hand, Herbie: Fully Loaded only seemed to accrue negative publicity before it opened – like the completely ludicrous revelation that the entire film had to be digitally retouched to reduce star Lindsay Lohan’s breast size after parental complaints at advance screenings. And then there was Lindsay Lohan herself, who seemed a promisingly talented actress in the previous Disney remake of Freaky Friday but by the time of Herbie: Fully Loaded had become another celebrity whose private life – troubles with her parents, diva demands, drunken antics, car crashes, being very publicly redressed for unprofessional behaviour by studio bosses, eventual drug busts, followed by rehab and jail sessions – intruded so much into the gossip columns that, like Jennifer Lopez and Mariah Carey, it reached a saturation point that started to eclipse any presence the star brought to a vehicle. On the plus side, Herbie: Fully Loaded did have in the director’s chair Angela Robinson who made the wonderful D.E.B.S. (2004), an hysterically funny gay parody of Charlie’s Angels (1976-81). Although after this, Robinson vanished into television for over a decade until she emerged again with Professor Marston and the Wonder Women (2017)about Wonder Woman’s creator William Moulton Marston. Sadly, Herbie: Fully Loaded settles in with a charmless and entirely formulaic monotony. There is nothing to the film other than packaged formula – a successful franchise from the past resurrected, a cute teen star (who was not even been born when the last Herbie film was made), lots of slapstick, easily identifiable comic villains (you can tell who they are – the car keeps squirting them with oil) and a soundtrack of recognizable hits from yesteryear. The character arcs in the story – Maggie has to get Herbie back, the problems over her secret identity and winning her father’s support, she entering the big climactic race despite the odds against her – have an utter predictability. Herbie: Fully Loaded is slickly made but there is nothing in it that has any of the wacky sight gags that the original films did or even raises the odd smile. Equally, one kept wondering where the hilariously droll visual deadpan that Angela Robinson demonstrated in D.E.B.S. has vanished to. Fully Loaded is also the first Herbie film to be made following the CGI effects revolution and as a result Herbie is more anthropomorphically animated and fantastical in its moves than previously. The major minus point about Herbie: Fully Loaded is the fact that it must hold some kind of record for the number of product placements in a film. Indeed, there are times when the entire film resembles one of the NASCAR cars and drivers that we see throughout where every single square inch of their surface is plastered with brand name labels. You wonder if Angela Robinson is being slyly subversive or if the film simply fails to appreciate the irony when, despite this product placement saturation throughout, the story has Matt Dillon’s villain as someone who is surrounded by corporate sponsorship, while the film itself is rooting for the underdog family that is struggling to find any at all.